You will be given a reference e-book to read which has 442 pages And the test will be based on that e-book , you can take final test within 1 year of purchase. What is Google SketchUp 8? 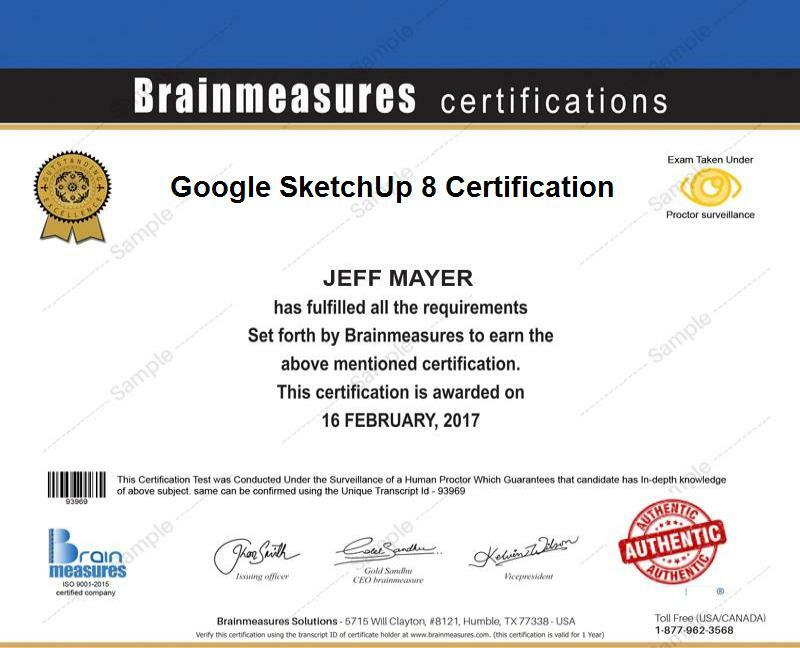 Becoming a real expert in the field of using Google SketchUp 8 is never difficult if you take part in the Google SketchUp 8 certification program which is now available at Brainmeasures. Considering the excellent reputation of Brainmeasures, you can expect this online certification company to provide you with all the information that you need to become a real expert in the field after deciding to enroll in its Google SketchUp course. This certification course gives you the chance to undergo a real and extensive Google SketchUp 8 training which is guaranteed to help you understand the major roles and functions played by Google SketchUp 8, the specific features installed in the program, the set of tools that form a major part of it and the many things that you can do to take full advantage of the program especially in the field of mechanical, architectural, civil and film and video game designing. The certificate that you will receive from Brainmeasures after you complete its Google SketchUp 8 certification course will already be enough to show how proficient you are in using the program. How to view models in various ways? How to print your SketchUp work and effectively export animations and images? Due to the many things that you will learn from the Google SketchUp 8 certification program offered by Brainmeasures, it is safe to assume that it will continue to benefit anyone who is greatly interested about increasing the level of their knowledge about the program. This is most suitable for all individuals and professionals who have little or zero knowledge and experience about 3D drawing and SketchUp but who are greatly interested about starting to create highly effective models with the help of this popular modeling program. Being one of the holders of Google SketchUp 8 certification is also a major help in improving your financial stability. You may find your Google SketchUp 8 certification useful in getting the position of a Google SketchUp 8 artist which gives you the opportunity to earn around $48,000 to $70,000 annually. You may also work as an architectural designer which allows you to receive a salary within the range of $75,000 to $110,000 per year.